The accident resulted in a white SUV toppling on its side with damages. 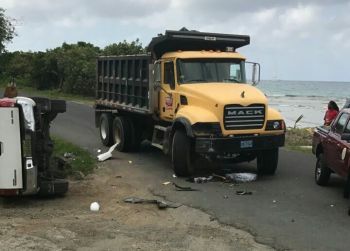 It is unclear at this time what resulted in the mishap, however, from all appearances the SUV was heading east in the direction of Road Town while the truck was proceeding in the opposite direction. Police are already on the scene. We will provide more details as they come in. Some of those truck drivers don't take into account the size of the roads for 1, and the speed they're moving! 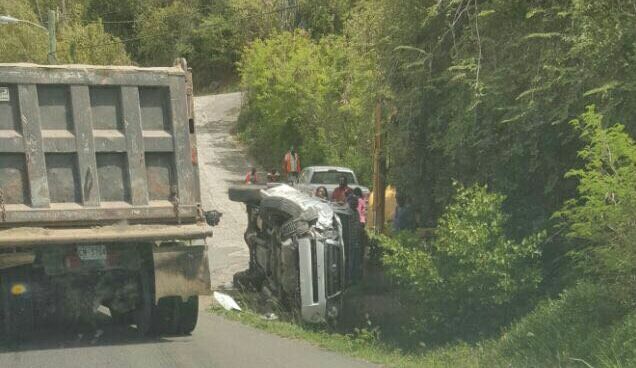 The BVI needs more rules, and policing JUST FOR those heavy equipment vehicles mannn! What that big truck doing in the middle of the road! wha deh truck doin on deh man side? That looks like the result of a game of chicken where neither one chickened out! That truck clearly in middle of road. Silly @$$ trucks owning the road. From the picture it looks like the Truck was turning, if the front wheel and the position is any indication. There're a few turn offs in the area. The SUV may've been surprised by the Truck around that corner. Every morning there is a Blue school bus that speeds down this road heading West around 7.40/8am always speeding round corners on the wrong side of the road with a bus full of children. One day its going to end in disaster. Speed Cameras, Speed bumps or Police Patrol is needed on the West End road. He will kill someone soon! All the roads needs to "yellow lined" in the center. Makes it easier to navigate especially since that roads are so narrow already.